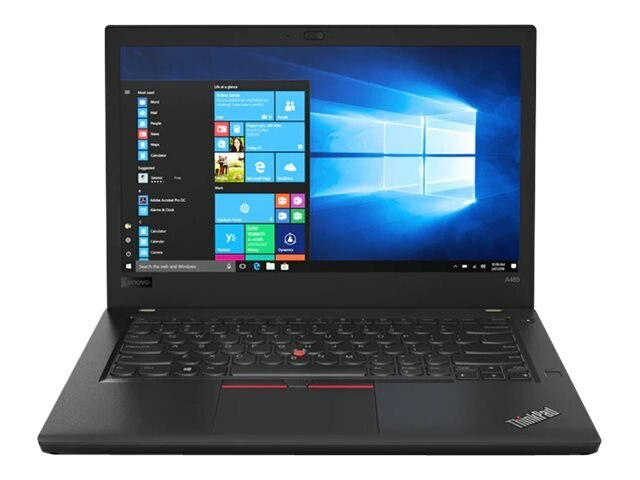 The ThinkPad A485 is lightweight and easy to carry without sacrificing on performance. Power forward with superior processing and fast graphics that make multitasking a cinch. Biometric and encryption security protect critical data. 16GB 2666MHz* DDR4 SDRAM, expandable to 32GB. There are two slots. One holds a removable 16GB chip and the other is available. Video memory: Shared system memory with integrated AMD Vega 10 Graphics. Integrated and external Li-Ion battery packs, each with 24WHr capacity and a combined run time of up to 10.7 hours depending on configuration and usage.